This is my follow-up post to one a few weeks back about how lifting heavy weights will not get you bulky and is one of the fastest ways to effectively lose fat and build lean muscle. calories they were consuming on a daily basis. We'll call them Clients M, J & K.
all of them on similar strength and muscle building programs. with him, 2 days we worked the upper body and 2 days we worked the lower body. Otherwise the routines were the same from a set and rep standpoint. to allow for movement from one exercise to the next without rest. *Pounds of Fat Lost: 57Lbs. *Pounds of Muscle Gained: 3Lbs. *Pounds of Fat Lost: 20 Lbs. *Pounds of Muscle Gained: 2lbs. *Pounds of Fat Lost: 8 Lbs. *Pounds of Muscle Gained: 4Lbs. weights, the same routine that is thought by many to make you "bulky". any athletic event you are participating in. 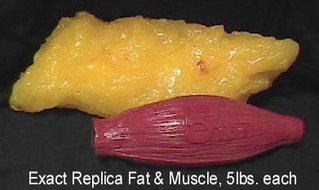 muscle and some subcutaneous fat that the body doesn't want to get rid of and you'll have wasted a ton of time. Oh, and ironically enough, another fitness expert who I follow and believe in his methodology just posted a similar article on his website today. John Romaniello is a very well respected trainer in New York City. Let me know your thoughts or questions, I'd love to here them!